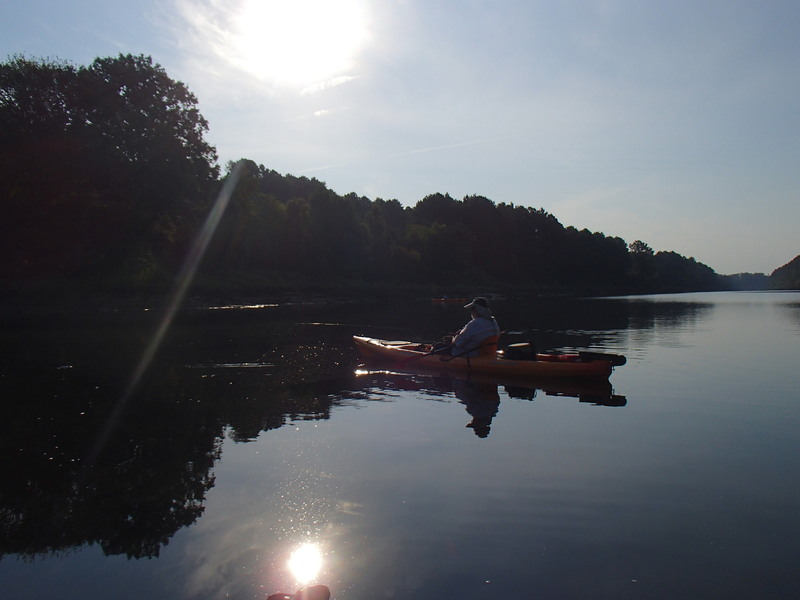 There were 8 anglers in 7 Kayaks and 1 Canoe There were over 200 fish caught We had great company, Good food, Perfect weather. 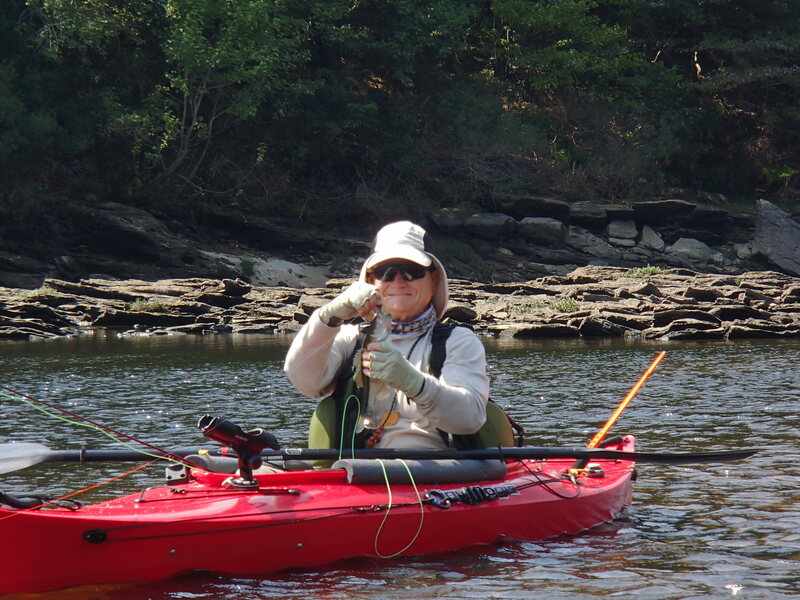 But if you want the details…..
Mary-Kay, Skip, Larry, David, Rob and I met Crawford at his place on Toledo Bend before dark and 4 of us immediately started throwing a fly line, with little, if any success. Rob and Crawford cooked the steak and baked potatoes for dinner when it started getting dark, as we snacked on the veggie tray that David had brought. After diner there was this amazing, and rich, chocolate cake waiting, thanks to Larry. The entire group woke up at 0430 to breakfast casserole that Mary Kay had made the night before, and coffee. Instant human, just add coffee. All the fishing gear that wasn’t loaded was then quickly loaded as breakfast dishes were taken care of and the 7 of us was on the road by 0600. Since this was a short, 5 mile drive, and the new improved boat ramp was easy to find in the dark we were at the river in a very short time. 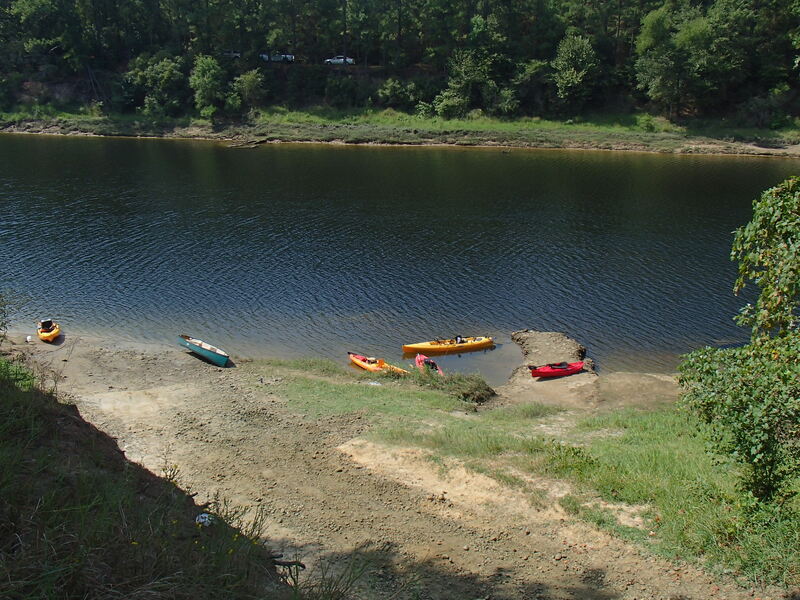 Now we had the challenge of getting all of the watercraft down the hill. I backed the trailer down with 2 kayaks and a canoe, and since this was so much fun to do in the dark, we decided to carry the other 5 kayaks down by hand. Even with all this fun, we were still on the water by 0700. By this time Rene had joined us, bringing our number up to 8. 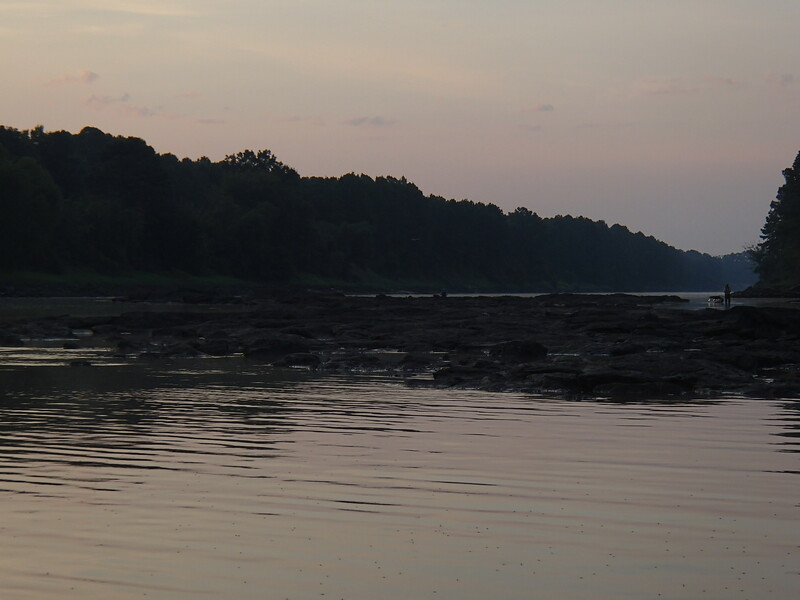 We watched the sunrise at 0706 while moving to the first fishing location, the first rocks. The first three fish were hooked and landed before we go to our first fishing area. There were dozens of white egrets standing on the rocks that we had chosen as our first fishing area. They were standing there in the hopes of the white bass hitting the shad, and them, then picking up the leftovers. I only saw a few of them feeding, but not in that crazy way they do when the fish are chasing shad. We had perfect weather for this outing, with very few clouds, and no wind all morning. When Rob checked the website he found that there was no generation scheduled for that day, meaning that we could stay in the generation canal all day, and not have to jump over to “cold-water” this time, like we did last year. There was great water clarity and temperature. It was so good that there was a group of scuba divers getting certified just across from our launch point. 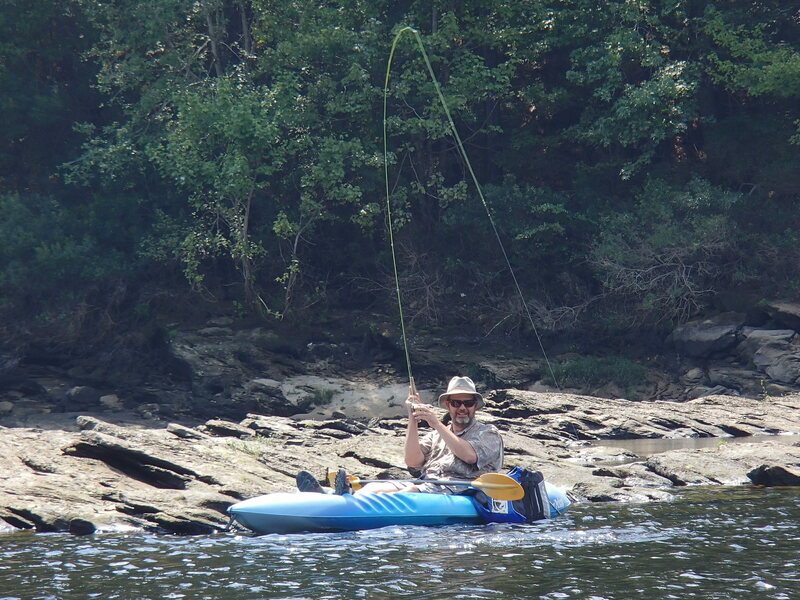 We started fishing at the first rock and as the sun came out we drifted slowly downstream, fishing as we went. 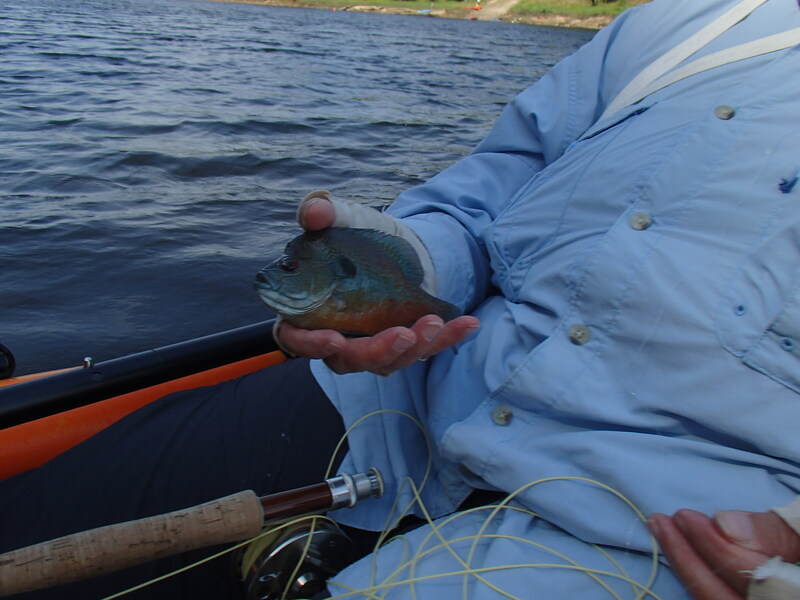 As we kept catching fish, we switched flies from “what works” to “what else works.” Small (size 6-10) poppers worked very well most of the day, as did small minnow imitators, like the Cypert’s Minnow. Most of the fish were spotted (Kentucky) bass, with a few yellow sunfish thrown in for color. There were also some bluegills caught, along with one gar landed (Skip). 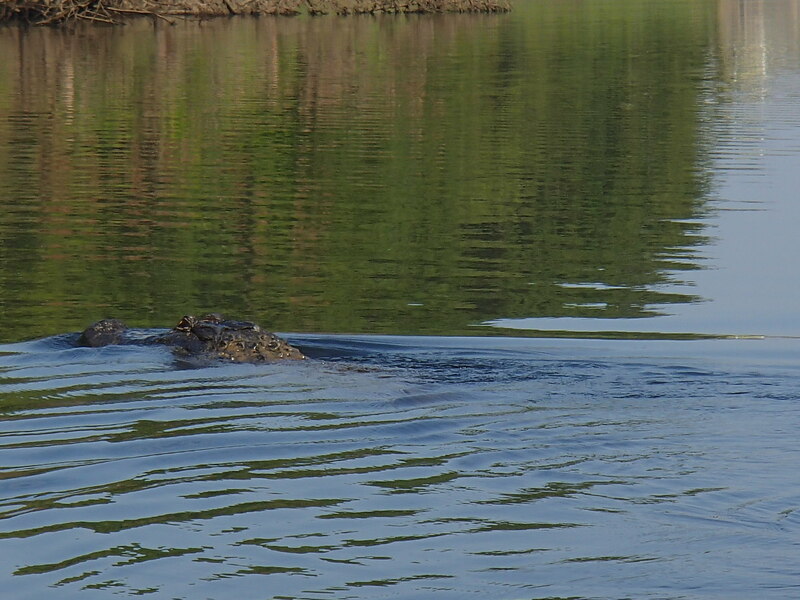 As we made our way back to the launch point for lunch we saw one 8+ foot alligator cruising in the middle of the river. 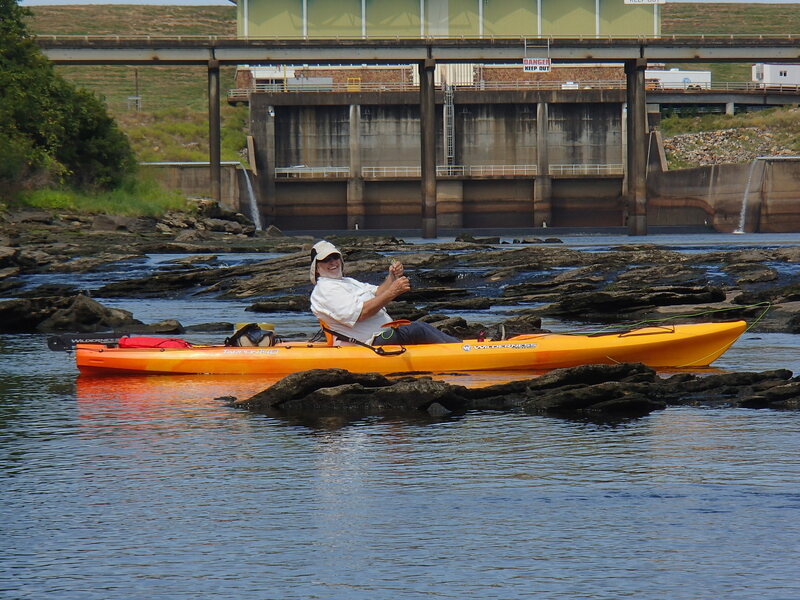 He wasn’t aggressive, and he watched us warily as we made our way upstream. One smaller, 4+ foot alligator was lounging in the shallows, apparently sunning. 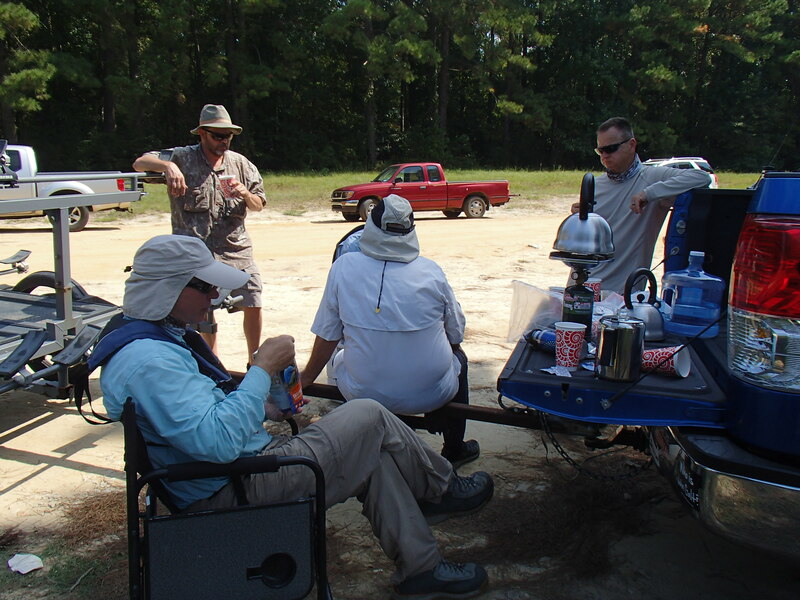 Lunch was at noon, back at the trucks, with coffee brewing and plenty of talk about the morning. When we said to bring your own lunch, I had no idea as to what diverse types of food are considered “lunch.” Sandwiches, dehydrated foods, fruit, etc. The view of the launch point from the parking area. 6 canoes full of boy scouts launched while we ate lunch. 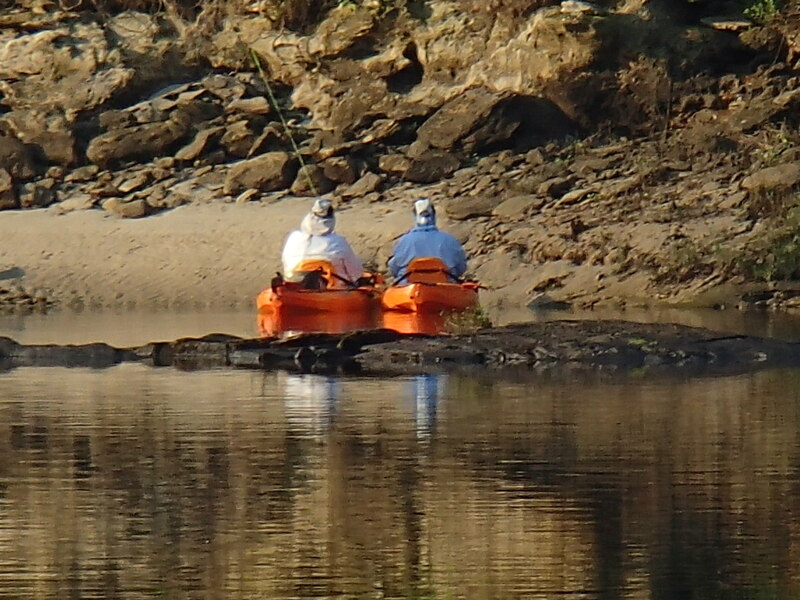 They planned to spend the night on a sandbar on the way to the next take-out, 10 miles down the river. The light wind in the afternoon came out of the north, pushing everything down the river. 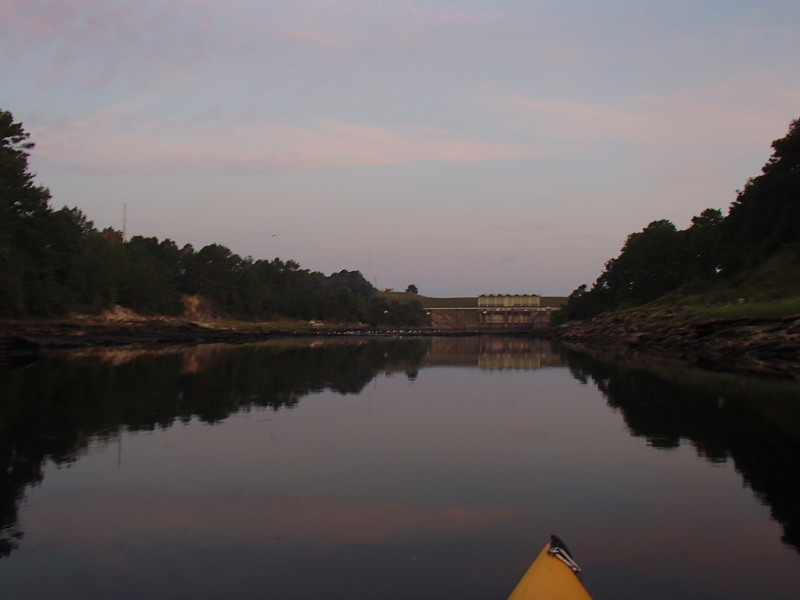 Most of us went upriver against the wind, making it easy to drift back to the launch point. 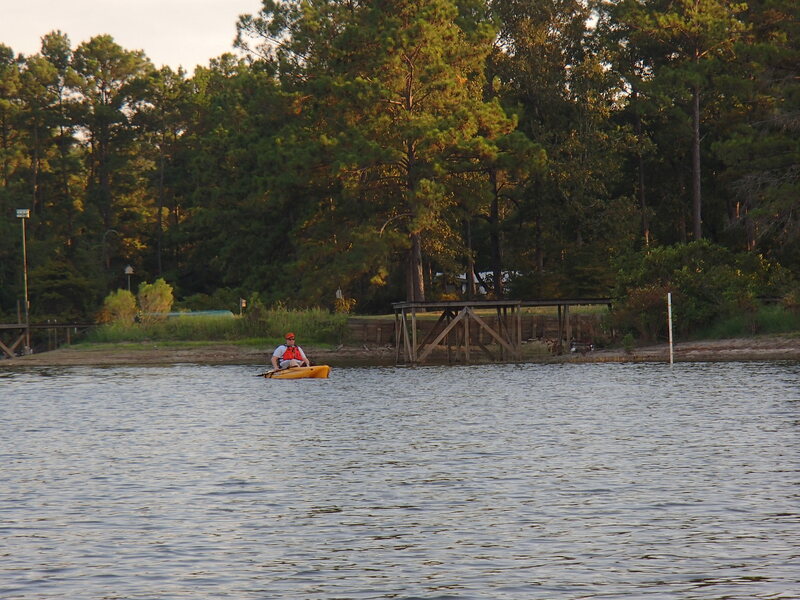 One brave soul, Rob, decided that he wanted to explore down river. Perhaps we can get him to tell his tale. 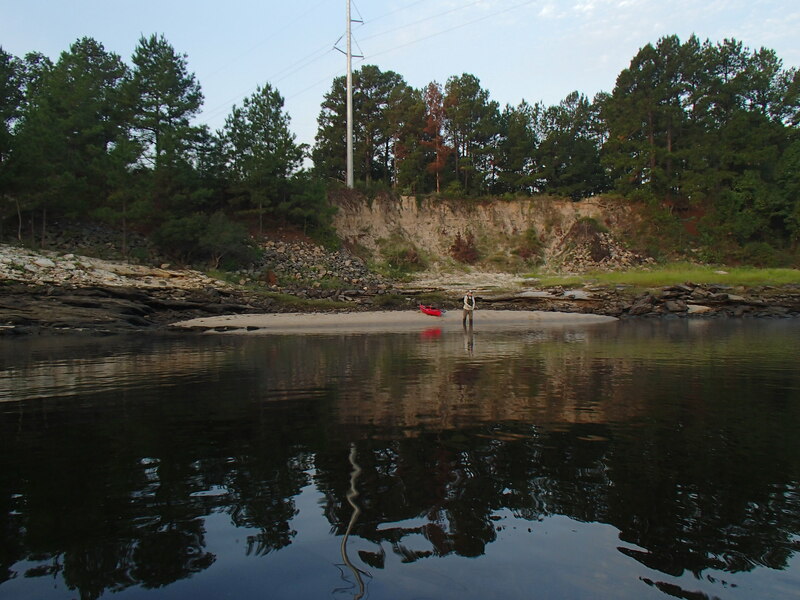 12 canoes from “Tak-A-Paw Expeditions” came around the bend as we were making our way to the take-out point. They had launched on the Louisiana side at 0700, and were just no making it to the take-out. We were off the water at 1530, and loading up. Crawford invited us to stay one more night, and a couple of us took him up on it. If I wouldn’t have made promises, I would have also stayed. Those of us who stayed with Crawford Saturday night, breakfasted on the leftovers from the previous day, and were on the road back to Houston by 10:30 am. This posting showed up on my Facebook newsfeed. This would never have happened with the old website.